rights (lesbian, gay, bisexual, transgender, questioning). The only organization of its kind in South Florida since 2002.
de la Florida desde el 2002. $5 Donation gets you hundreds in discounts! Special Invitations to UC|CU programs, lectures and workshops. Invitación especial a todos los eventos, charlas, entrenamientos y presentaciones de UC|CU. UC|CU’s own local|National & International LGBT & related resources. Lista única de recursos comunitarios LGBT - local, nacional e internacional. protect & defend our civil & political rights; and supports our many public outreach & educational programs. NEW BUSINESSES & SERVICES are signing up every day! …Don’t miss out! AMBIENTE Magazine, UC|CU website & e-mail blasts. • Participation in our membership program is offered FREE OF CHARGE for one year for participants. 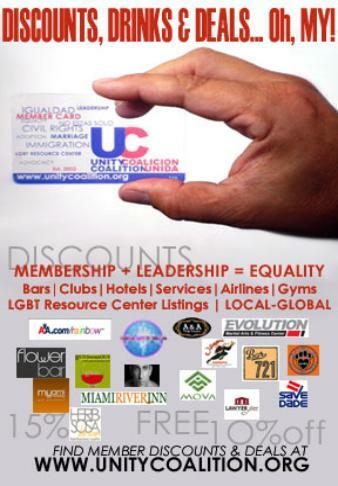 You must present your UC|CU MEMBER CARD to receive discounts & benefits! 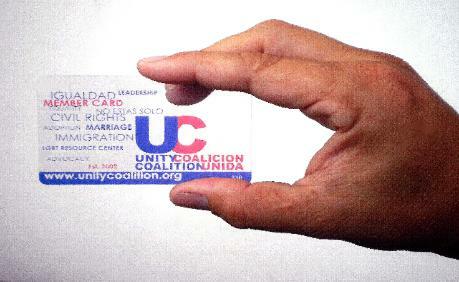 Latino|Hispanic|LGBT empowerment & equality efforts of UC|CU. Palm Beach & Fla Keys! UC|CU’s own local|National & Int'l. DISCOUNTS, DRINK & DEALS... Oh MY! by Nino's Catering with each order. on Sunday Brunch & Special Events.